The Podwits proudly introduce their new resident movie reviewer extraordinaire, Luke Whitmire, who will be providing us with his unique take on new films. Thank you Brotha Luke! I LOVE THIS FILM IMMENSELY! The best in the series! Well, the political pundits on both sides have been bickering back and forth about the sociopolitical message in The Dark Knight. I don’t know if you have heard. OK, before I write about the quality of the film—you probably want to know now if this Batman film is leaning towards the liberal or the conservative agenda. Well, allow me to elucidate. I don’t think it’s overtly siding with a particular political ideology; after seeing it for myself, the political aspect of the film seems muddled. All the politics and jabs at economic inequality feel hollow, used as wallpaper for the narrative. I wouldn’t be surprised, though, if the left-leaning commentators seize on the notion of prisons being packed under false pretenses, while those on the right note that an oppressed Gotham City being held hostage by Bane resembles an anti-Soviet propaganda film, complete with show trials, masses of poor people huddling by open fires in office lobbies and rich people being thrown out of their homes while gun-toting thugs roam the streets. The political allegory is cagey. Yes, the movie makes some political thunder, but it’s empty, used as a mirror and story thread to illuminate the sociopolitical time we live in. Nolan focuses the narrative on other ideas and concepts rather than political ideologies to propel the narrative along. As a matter of fact, Nolan shows the elite within the government as the heroes of Gotham! 🙂 To me, Nolan’s underlying political message is: anarchy and terror will never resolve any injustice, economic or otherwise. Any mob form (poor, middle class, wealthy, conservative or liberal) is worthless and obtuse to institute an ideology. Furthermore, Nolan examines the need for truth and the accountability of justice without siding with a political party. I thought the second entry had a more precise and clear political message than this film. The Dark Knight was about our new age of terror, with the Joker—who only wanted to “watch the world burn”—standing in for Osama bin Laden, and Wayne’s invasive use of surveillance meant to evoke the Patriot Act. 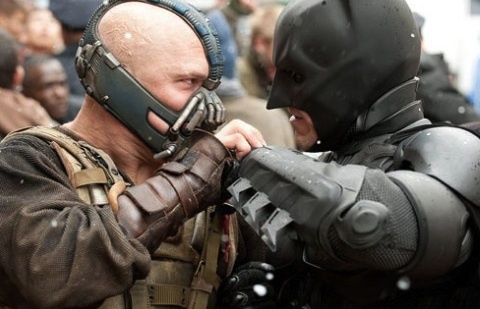 This film’s portrayal of Bane is a little arcane. 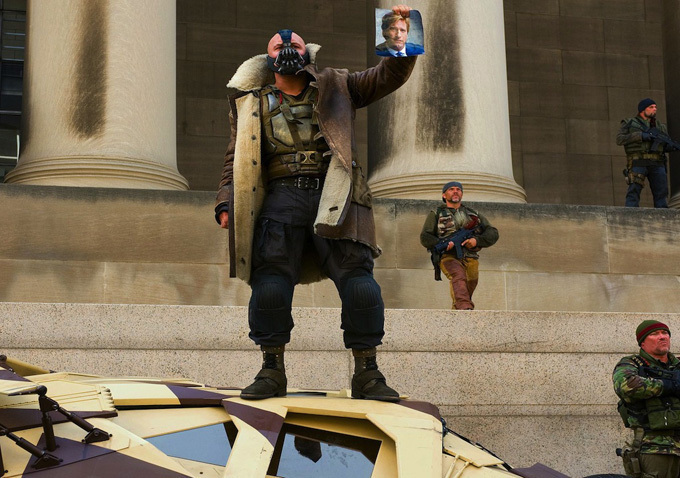 There has been a little controversy over BANE representing Mitt Romney’s ideology and his BAIN CAPITAL. Well, his attacks on Gotham City are rooted in Occupy Wall Street and militant Marxism, yet at the same time he simply wants to destroy Gotham by blowing it up. What is Bane—anarchist, communist or apocalyptic madman? He is not some right or left-wing political symbol! And then what, in opposition, is Bruce Wayne, and how does the film interpret their conflict? It’s all a little too vague, but I like that aspect in Nolan’s films. In my opinion, Nolan has always made us find our own answers, and the ambiguity could be what makes this trilogy and the rest of his films so unique and successful. I believe Nolan is just showing an accurate assessment of what’s happening in today’s culture. He also is paying homage to Charles Dickens’ famous masterpiece, A Tale of Two Cities, one of my favorite literary works growing up! The film is textured with Charles Dickens. 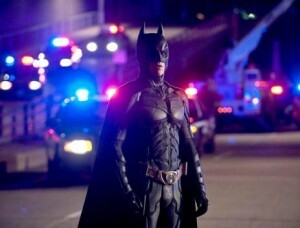 Well, The Dark Knight Rises truly is an action opus that is viscerally and intellectually engaging! Wow—a film that generates a furious surge of emotion that all the other super-hero films before it combined couldn’t muster!!! Even at its most heated moments, the movie remains elegantly cool andfantastic!!! Chris Nolan’s denouement is epic, yet so personal and pertinent to our time. A wonderful and singular catharsis that accentuates all issues and themes in the previous films. I associate the word “PORTENTOUS” with this film—a sonorous undertone that rumbles underneath. Nolan is a very classical director, which makes the Dark Knight films, especially this one, stand out from other comic-book movies. As I watched this film, I couldn’t believe how well Nolan is grounded in an old-school aesthetic, even though he devised this robust, mainstream movie. The second act is a little bloated, but the scope here is unashamedly novelistic. This Batman film is darker, more complex, ambiguous, and mines the depths of despair and pushes the story to an extreme place, so the heroic figure of Batman is needed more than he has ever been needed. His symbol achieves an even greater stature! Bruce Wayne’s heroic undertaking is primal, physical, and emotional. We finally get to see the man behind the mask showing an authentic human side up close—a very poignant and powerful image! Also, We witness Bruce becoming Batman twice, but both times it’s amazingly effective and really makes you invest in Bruce’s hero journey. Chris Nolan stages both these setups so efficiently. The coolest dynamic in this new batman film is Chris Nolan’s assertion and belief in the possibility of “resurrection” and “transformation”, both on a personal level and on a societal level. He also asserts a strong theme of duality that’s very effective with all the main characters that gives the film a more profound narrative!! the film has a direct and indirect allusions to the French and Russian Revolutions, and the class warfare we are witnessing in our generation, which gives the movie more of the feeling of a historical epic. Nolan illuminates our current financial woes, but like I said above, he doesn’t praise or side with any one political agenda from the right or the left. Maybe I’m reading too much into all this, but that’s pretty much what I deduced from the narrative sub-plots. Other than James Cameron, Chris Nolan has a creative genius that really supersedes all other directors working in the Hollywood system today. This film encapsulates for me the notion of “rebirth” and “spiritual renewal”. The first film dealt with the themes of fear and father figures. The second film dealt with the theme of chaos and moral code. This third entry focuses on duality, transformation, resurrection and belief. The recurring theme of belief is the foundation of this film. 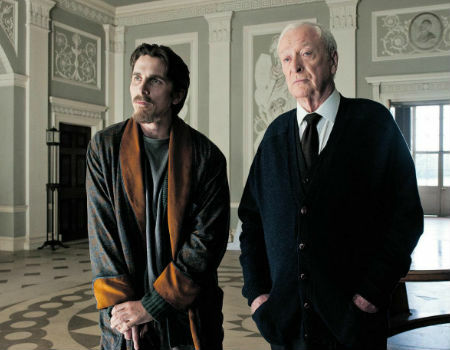 Very cerebral themes that resonate and are the very fabric of the Bruce Wayne story arc. Furthermore, is the there a Christ allegory in the title?? 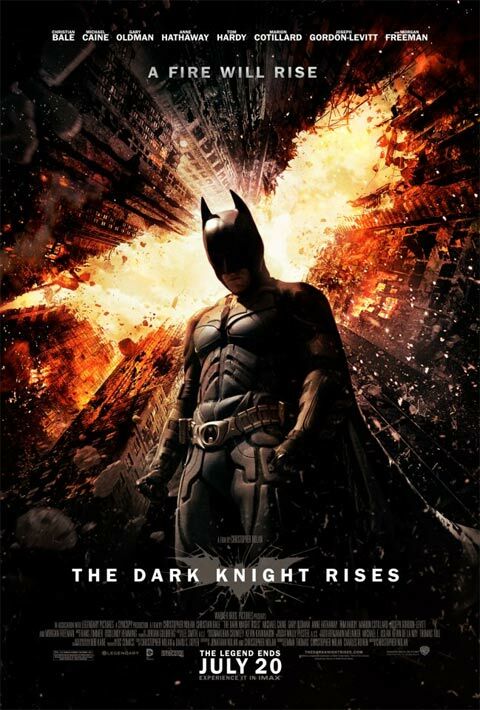 The Dark Knight RISES—the word “RISE” in the title ties an important arc in the film. What I found to be interesting and very compelling about this film is that each character has to destroy their demons to find happiness and purpose. They all have to rise out of despair or a particular stronghold in their lives. Later in the film Bruce Wayne is held prisoner in an ancient hell across the world. This prison is dark, underground, with a hundred-foot stone shaft that the prisoners can choose to climb their way to freedom. Only one person in history has made it up the stone shaft to liberation. In fact, we’ve been told that the shaft and its promise of freedom are there only to offer the prisoners in the pit some delusional hope, much as some Christian doctrines hold that the damned souls in hell can see Paradise, but can never get there. 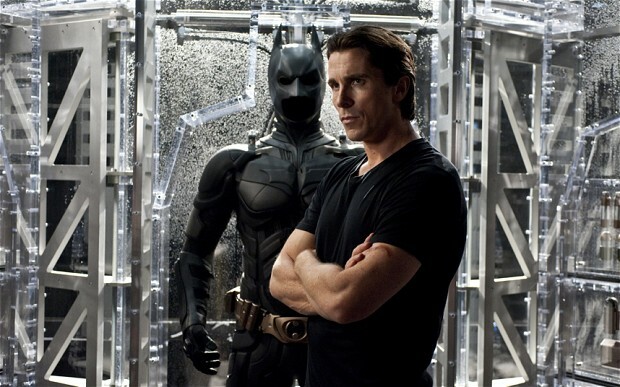 Bruce makes it out on his third attempt after he goes through an arduous rehabilitation process of conquering his fear and despair—after he has been “recalled to life”. Only then can Bruce rise to redemption. Jesus Christ rose from the shackles of death on the third day. Bruce Wayne is a tortured Savior, a Christ figure for a fallen city. It always seems like man has to be broken first before man can be used in extraordinary ways. The protagonist and antagonist are as diverse and complex as they are intriguing. Bruce Wayne/Batman, played by the dark and brooding Christian Bale, has reached the crossroads of his relatively short life. He has isolated himself, while indolence and apathy have become his refuge. Bruce is unresponsive with a broken spirit, wallowing in self-pity. This time Batman has no hope, he is broken inside and doesn’t know how to heal the people and chaos around him, due to his negative actions. There is a sense that he has regressed back to the fearful boy from the first film. Selina Kyle/Catwoman, played by the beautiful and curvaceous Anne Hathaway, gives an intoxicating performance. She invests her catlike woman with verve and impertinence. Her story thread is woven together so efficiently. 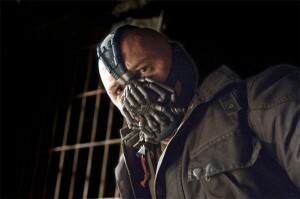 And Bane, played by Tom Hardy, is the chaos in the film, the villain that escalates the dystopia in Gotham City. Hardy’s performance is absolutely vicious and menacing—just a look from his cold, emotionless eyes could destroy you! Bane is a different sort of villain—a focused and more ideologically developed version of Heath Ledger’s—but one with equally ruthless charm. He leads with a combination of ruthless control and facetious empowerment, turning Gotham into a battleground for his own nefarious agenda by starting a revolution. He is an embodiment of invincible, a force-of-nature terrorism, a kind of figure that manipulates the system and its people. Bottom line: I found the last thirty minutes or so almost unbearably emotional, a great stretch from any of the previous films. A dignified conclusion for the Caped Crusader, but also the most outstanding installment in Nolan’s Batman series. Rest easy, Mr. Nolan has outdone himself and has devised a masterpiece! The Dark Knight Rises is emotionally inspiring, aesthetically significant and critically important for America itself—as a mirror of reflection and resilient hope. This may go down as one of the great classics in cinema history!